I had some home alone time recently so I could swatch in peace, which means I was able to catch up with some reader requests and other comparisons I've been wanting to do. 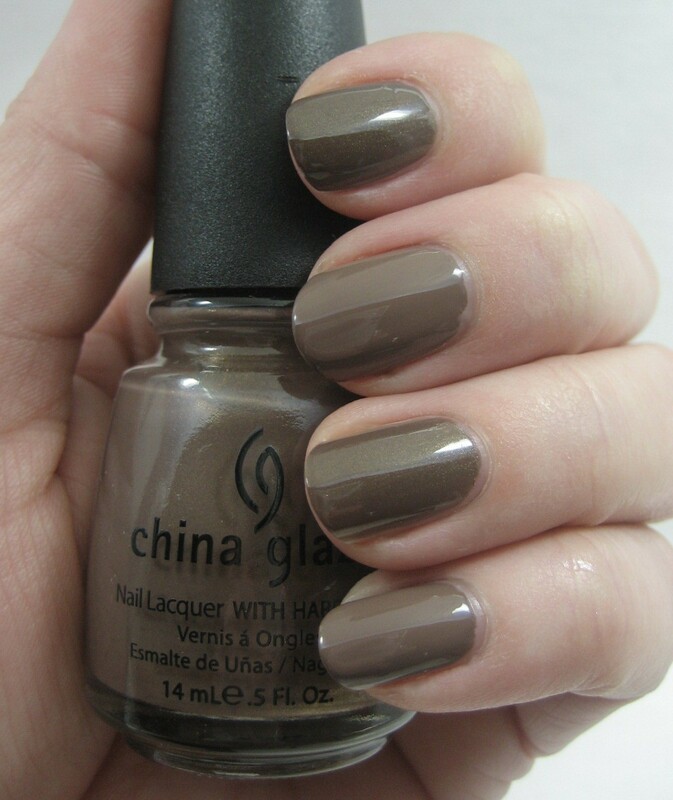 Ages ago, Steph asked how China Glaze Ingrid compares to Barry M Mushroom. Thanks to the magic of swapping, I happened to have that Barry M, so it was only a matter of time before I got the two taupes together. Top to bottom: Ingrid, Mushroom, Ingrid, Mushroom. The base colors of these two are definitely close, with Ingrid being a just a tad darker, and of course the shimmer in Ingrid means these weren't going to be dupes regardless. Mushroom with a top coat of something very sheer and somewhat golden would be a good Ingrid substitute. 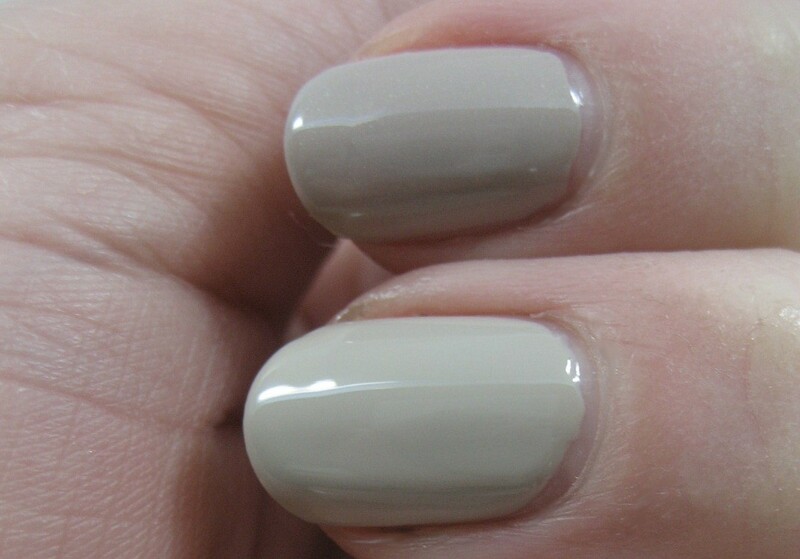 Since not everyone can get Barry M, I looked for another taupe creme that could substitute for Mushroom. I found Orly Prince Charming, which is really, really close. Mushroom (top), Prince Charming (bottom). Hermetic asked about RBL Jane and Essie Playa del Platinum. Ingrid (top), Playa del Platinum (bottom). 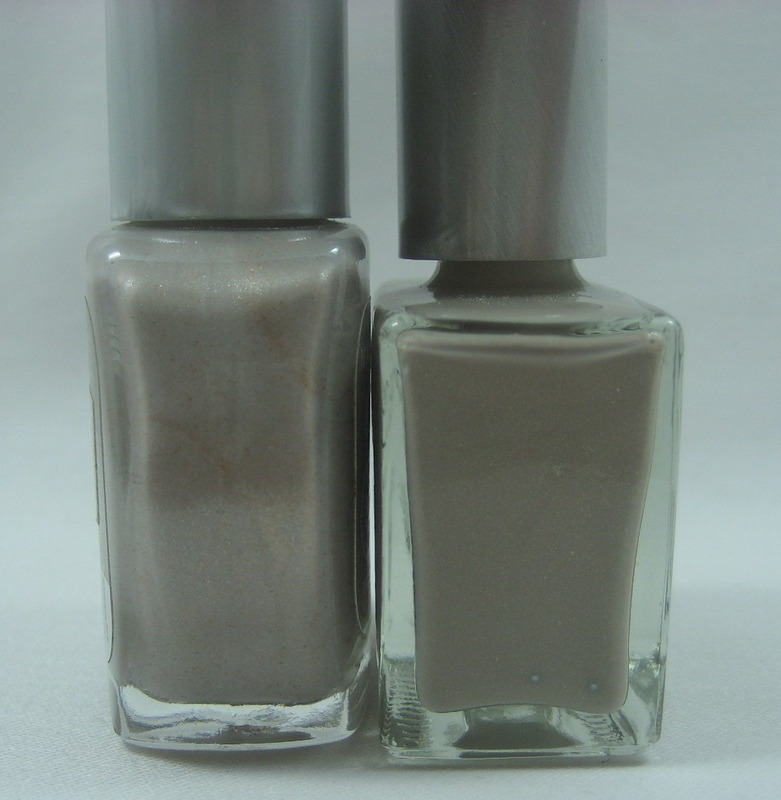 These are similar, but Playa del Platinum has a more yellow tone to it than Jane and also lacks Jane's subtle shimmer. Playa also took one more coat, needing three to Jane's two. I cam across a Maybelline shimmer that I thought might be a good stand-in for Jane; it's Opti-mist-ic from last year's winter collection (at least I think it was winter—might have been fall). Top to bottom: Jane, Opti-mist-ic, Jane, Opti-mist-ic. Yeah, not so much. The Maybelline is a much more obvious shimmer plus it has golden "floaties" which makes it a much less smooth look than the RBL. It also took three coats rather than the two for the RBL. 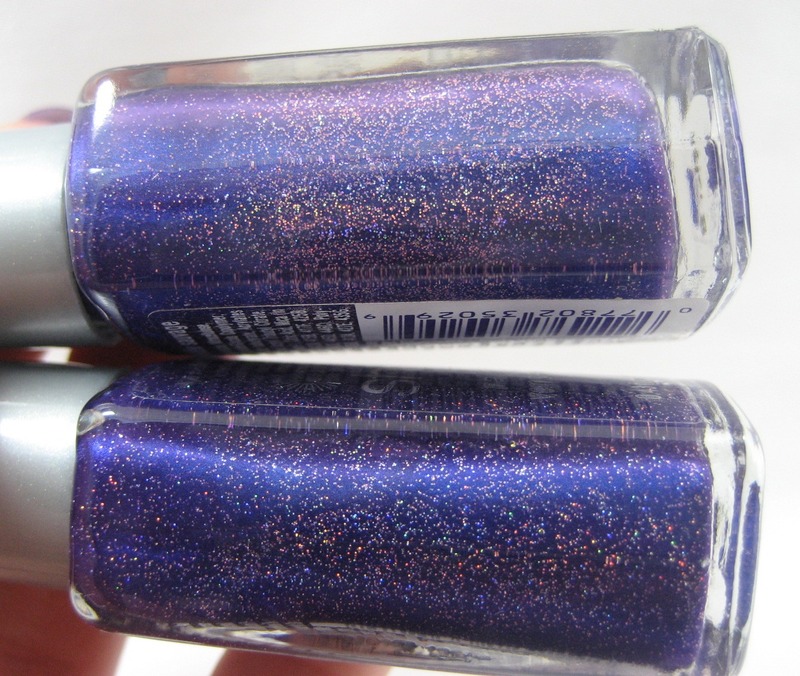 Poking around in one of my Helmers looking for something else, I found my bottle of Wet 'n' Wild Wild Orchid which I couldn't locate when I did swatches of the Glitz 'n' Glam collection. In the bottle, it looked like Wild Orchid might have more dense glitter, but on the nail, I didn't see that. In sun: Midnight (top), Wild Orchid(bottom). These look pretty dupey to me, so if you missed Wild Orchid, look for Midnight before the displays disappear. I totally missed out on "Wild Orchid", so I'll be looking for "Midnight" this weekend. I love your comparisons. I am totally into the "greige" thing right now but I didn't order Jane in my last RBL order (sigh). I do however, have Playa del Platinum. After seeing how close they are (well, maybe not to you, me and your other followers), I think I'll be fairly happy spending that $18.00 on something else. 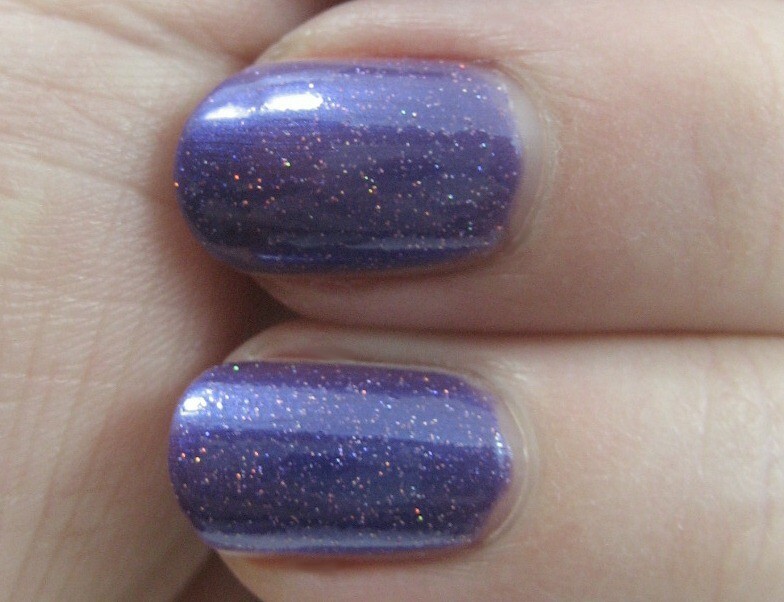 And a little shimmer over the Essie might be cool, maybe say… SH "So Dreamy", something I love to top my manis with. I love this blog, I look forward to all your posts! great swatches! 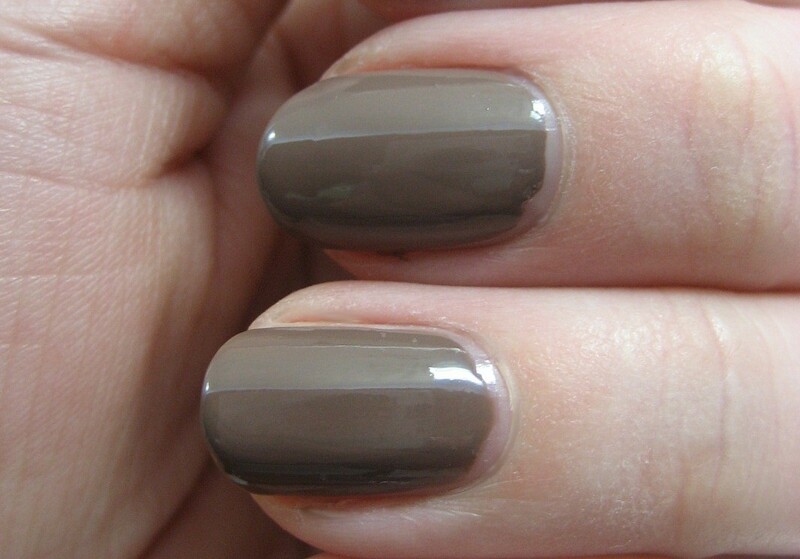 i like the subtle shimmer in Ingrid over Mushroom. Midnight looks really pretty! 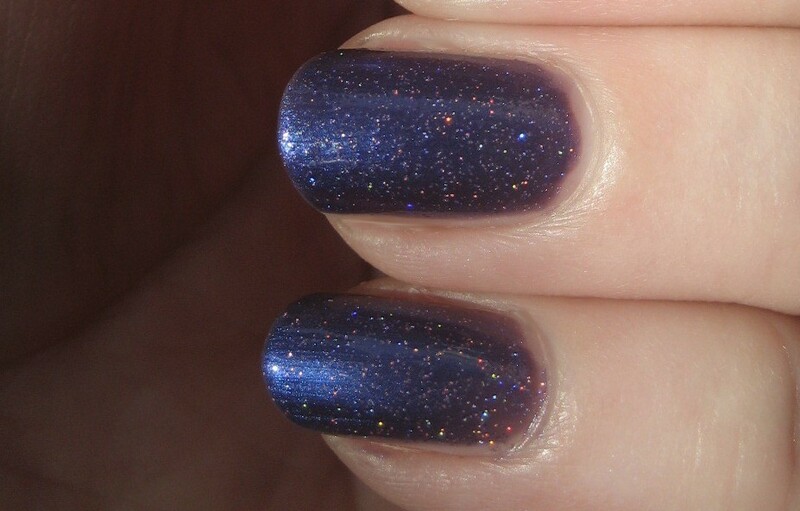 Its like what I wanted Sally Hansen Xtreme Wear Cosmic Blue to be like. I love your comparison pics, especially when you catch dupes!!! I loved Ingrid! I have been looking for something like it for a while now! I like Wild Orchid! really pretty! Thank you for this! I don't have Barry M and I was hoping to get it... but now I won't feel too bad about not having it cos it is pretty close to Ingrid which I also love. Thank you for going to all this effort!